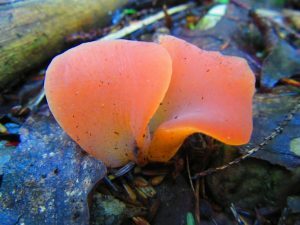 Jelly Fungi are truly special, having a texture that is absolutely unique and all their own. These mushrooms are gelatinous, soft and wiggly, and a delight to see and feel. There are several species in this family, including some edible varieties. Pictured is the edible Apricot Jelly and it is easy to see why it is so named. Though flavorless, it takes on the flavor of anything you cook it with. Ryan and I enjoy candying them in simple syrup to highlight their gumdrop-like essence.